1Department of Biology, Faculty of Sciences, Karadeniz Technical University, Trabzon, Turkey. 2Department of Forest Industrial Engineering, Faculty of Forestry, Karadeniz Technical University, Trabzon, Turkey. 3Technology Transfer Office, Karadeniz Technical University,Trabzon, Turkey. In present study, single and consecutive applications of xylanase and lignin peroxidase were performed in an XOQP TCF sequence to bleach pine and eucalypts kraft pulp. The consecutive use of Geobacillus sp. strain 71 xylanase and Rhodococcus jostii RHA1 lignin peroxidase was more effective than the single uses. XyzGeo71 treatment (X) indicates a 9,76% and 28,52% reduction in kappa number for pine and eucalypts kraft pulps, respectively. LiPRHA1 treatment (X) showed a 7,88% and 20,9% reduction a in kappa number for pine and eucalypts kraft pulps, respectively. The consecutive treatment of XyzGeo71 and LiPRHA1 (X), however, indicated a 13,67% and 37,2% reduction in kappa number for pine and eucalypts kraft pulps, respectively. The results showed that delignification with the consecutive xylanase and lignin peroxidase treatment was very significant. Keywords: Bleaching; Eucalypts; Kappa number; Kraft pulp; Pine. Pulp bleaching plants are the most contaminating section in pulp and paper industries which have recently experienced enormous transformations to alleviate their environmentally adverse impacts (Okan et al. 2015, Ferre et al. 2011). With these endeavors, new technologies have been developed, presented, and examined in bleaching and delignification steps. The related bleaching process however produces numerous organochlorine compounds that remain as intact bleaching waste in water. It is reported that these organochlorine compounds cause genetic damages (Sharma et al. 2014). The chlorine-free pulp bleaching applications has increased over the last decade with respect to eliminate the deleterious effects of organochlorine compunds (Sharma et al. 2015). Bleaching without chlorine is called biobleaching. It involves the use of hydrogen peroxide, ozone, oxygen, and enzyme cocktails and/or various enzymes such as manganese-peroxidases (MnP), lignin peroxidases (LiP), xylanases, and laccases. The enzymes for biobleaching are mostly achieved from multifarious microorganisms such as fungi, actinomycetes, and bacteria. Owing to their vigorous lignin degrading potential with rich enzymatic efflux, the white rot fungi have recently attracted extensive interest. In case of industrial applications, stability of fungi is not good in practical treatment under extreme conditions, such as higher pH, oxygen limitation (Bholay et al. 2012). By considering the advantageous characteristics, bacteria stand for as more cost effective enzyme producers in pulp and paper bleaching due to their efficient ligninolytic potential and better adaptation cababilities to bleachnig plant environments. The biobleaching is the most promising area in pulp and paper industry when considering the possible applications of enzymes. It is suggested that LiP treatment in bleaching process may improve the bleachability of pulps, by assisting to exclude lignin components from cellulose microfibrilles and without distrupting their physical properties (Carvalho et al. 1998). Xylanase is the one of the well known ezymes studied for prebleaching and it is reported that xylanase expedite the successive chemical bleaching steps of kraft pulp. Xylanase hydrolyzes the re-precipatated xylan of pulp fibre formed in due course of delignification process. In this manner, the pulp becomes more permeable and this facilitates the residual removal of lignin (Sharma et al. 2014). The pretreatment of various pulps with the combination of LiP and xylanase can be used so easily in bleaching sequences. Through enzymatic pretreatments in pulping industry, it is aimed; to reduce the consumption of chemicals, decrease the pollution load of bleaching plants ecologically, and improve the pulp brightness. In the light of the current knowledge, the present study focused on the improvement of effictive and synergistic use of xylanase and lignin peroxidase biocatalysts on pulp biobleaching. The various combinations of a xylanase produced by Geobacillus sp. 71 and a lignin peroxidase produced by Rhodococcus jostii RHA1 were tested to optimize the pretreatment conditions of pine and eucalypts kraft pulps. The XOQP TCF sequence was developed as the best pretreatment approach for the biobleaching of pine and eucalypts kraft pulps. Eucalypts kraft pulp and pine kraft pulp were used as unbleached materials. The eucalypts kraft pulp was a laboratory source supplied by the Karadeniz Technical University in Turkey and a pine kraft pulp was an industrial source supplied by the OYKA paper packaging industry in Turkey. The kappa number for eucalypts kraft pulp was defined as 21,53 and the kappa number for pine kraft pulp was determined as 50. The Geobacillus sp. strain 71, previously isolated from the Dikili-Bergama Kaynarca Hot Spring (Izmir) Turkey and characterized earlier by our laboratory (Canakci et al. 2007), was used as the thermophilic xylanase source. The recombinant plasmid designated as pXyzGeo71, encoding gene sequence of thermophilic xylanase, was used for xylanase production in E. coli BL21 (DE3):pLysS host cells. The Rhodococcus jostii RHA1, provided by Lindsay D. Eltis (University of British Columbia, Canada), was used as the native source and producer of lignin peroxidase (LiPRHA1). The Bacillus WB800 cell lines provided by S. L. Wong (University of Calgary, Canada), mutagenically deprived of most extracellular proteases, was used as the host during the heterologous expression and large scale secretory production of RHA1 lignin peroxidase. The pMA0911 plasmid, specialized for extracellular protein expression of in Bacillus system, was provided by Dr. Yu Xia (Jiangnan University, China). The thermophilic xylanase production and purification was performed as described by Canakci et al. (2012). The LiPRHA1 gene was cloned into pMA0911 Bacillus expression vector and the recombinant plasmid was transformed into the Bacillus subtilis WB800 host strain. The transformants were grown at 37 °C for 36 h in LB medium containing 100 μg/mL kanamycin for enzyme production. After 36 hours of growth the supernatant was separated from the cell pellet and used for the purification process of lignin peroxidase. The extracellular proteins from WB800 host cells were precipitated with ammonium sulfate (70% saturation). The concentrated enzyme mixture was dialysed in 50 mM sodium citrate buffer (pH 4,0) for overnight at 4°C. The dialysed enzyme was loaded onto a DEAE column (size 1 x 16 cm) which was pre-equilibrated with the same buffer. The adsorbed enzyme was washed with 50 mL of the same buffer and was eluted by applying NaCl gradient (0-200 mM; 50 mL + 50 mL = 100 mL). The active fractions were eventually combined and concentrated by ultrafiltration (Sartorius, 10000 MWCO filters). Xylanase activity was assayed by measuring the release of reducing sugars from oat spelt xylan following the dinitrosalicylic acid (DNS) method (Miller 1959). The activity of lignin peroxidase was assayed using the method reported by Tien and Kirk, exploiting veratryl alcohol as substrate and monitoring the formation of verataldehyde spectrophotometrically at 310 nm (Tien and Kirk 1983). One enzyme unit was defined as the amount of the enzyme which produces 1 µmole of the product per minute under the assay conditions specified above. Specific parameters for the pretreatment of pine and eucalypts kraft pulp were optimized for each enzyme. Pretreatment conditions were adjusted for XyzGeo71 as 70°C, pH 7,0 and for LiPRHA1 as 40°C, pH 4,0. On the other hand, additional reaction parameters such as H2O2 concentration, veratryl alcohol concentration, consistency, enzyme dose, retention time, and the amount of oven-dried pulp were also optimized. To determine the effectiveness of different pretreatment processes, the kraft pulp samples were treated in polyethylene bags, washed with distilled water, and then were analyzed for the identification of Kappa numbers. All bleaching experiments were carried out in polyethylene bags for examining different steps of bleaching sequence. The Total Chlorine Free (TCF) bleaching sequence performed in this study was “XOQP”. X refers to the enzymatic treatment with xylanase and lignin peroxidase, O illustrates the oxygen delignification stage, Q represents the chelation treatment, and P exemplifies the bleaching with hydrogen peroxide. Washed and oven-dried Kraft pulp was filled into dry polyethylene bags and pretreated with xylanase and lignin peroxidase under optimized experimental conditions. Then, the pulp was subjected to the bleaching sequence for downstream analyses. The pine and eucalypts kraft pulps were treated with XyzGeo71 and LiPRHA1 catalysts either separately or consecutive (first XyzGeo71 and then LiPRHA1) under optimized conditons. The experiments were carried out in polyethylene bags and the final reaction mixture was then incubated in a water bath shaker. Then, a portion of pulp was washed with distilled water and then Kappa numbers were determined according to TAPPI T236 cm-85. Oxygen delignification was performed under 7 bar pressure using O2. Concentrations of NaOH and MgSO4 were 4% o.d.p. (oven-dry pulp) and 1% o.d.p., respectively. Temperature, time, and pulp consistency were kept at levels of 100°C, 60 min, and 12%, respectively. And then, the pulp samples were washed with distilled water and further analyzed for Kappa number. Chelating treatment was performed by using 2% EDTA. Time, temperature, and pulp consistency values were 60 min, 90°C, 12%, respectively. The process was executed at pH 7,0. Hydrogen peroxide treatment was performed using optimized concentrations of H2O2, NaOH, and MgSO4 as 5%, 4%, and 1%, respectively. The experiment was carried out at 80°C for 120 min. The Kappa number, as an estimation of the lignin content left within processed pulp, was determined by the reaction of pulp samples with acidified potassium permanganate Tappi method T236 cm-85 . One unit of kappa number is defined as the amount of 0,1 N potassium permanganate solution consumed by 1,0 g of dry pulp (Senthilkumar et al. 2008). were prepared under standardized conditions based on TAPPI standard methods (TAPPI 1996). Hand sheets were formed as 70±5 g/m2. Paper samples obtained from bleached pine and eucalypts pulp by the Rapid-Köthen method were conditioned for 24 hours in air-conditioned room according to ISO 287. Unrefined pulp was used to obtain 10 paper sheets (ISO 5269-2) and to determine basis weight (ISO 536). The burst indexes of handsheets were measured according to T 403 om-97method, the tensile indexes of handsheets were determined by the T 404 cm-92method, and the tear index was identified by the T 414 om-98 standard procedure. Brightness was calculated according to the ISO 2470-1. Before analysis of scanning electron microscopy, the XyzGeo71-bleached, LiPRHA1-bleached, XyzGeo71-LiPRHA1-bleached and nonbleached kraft pulp samples were sputter coated with a gold. Zeiss Evo LS10 sacnning electron microscope was used for morphological investigation of pulp samples. An operating voltage of 5 kV and secondary electron moade was selected. (Roncero et al. 2003a, Nagar et al. 2013). The potential use of LiPRHA1 and XyzGeo71 enzymes in pulp and paper industry were evaluated upon bleaching pine and eucalypts kraft pulps. The maximum biobleaching conditions of pine kraft pulp with XyzGeo71 were identified as; 120 min incubation at 70°C, pH 7,0; 30 U/g xylanase use at 10% consistency. 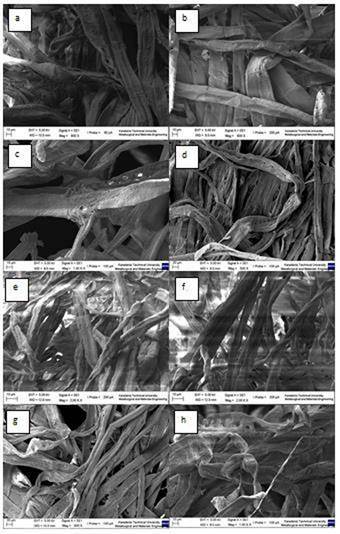 The most efficient biobleaching of pine kraft pulp with LiPRHA1 on the other hand was obtained under the conditions; 90 min incubation at 40°C, pH 4,0; use of 6 U/g lignin peroxidase at 5% consistency and in the presence of 0,5 mM H2O2 and 4 mM veratryl alcohol also specified in Table 1 and Table 2. The optimized conditions required for the maximum biobleaching of eucalypts kraft pulp with XyzGeo71 instead, were 120 min incubation at 70°C, pH 7,0; 30 U/g xylanase use at 5% consistency (Table 1); the optimized incubation conditions for for LiPRHA1 was identified as 90 min incubation 40°C, pH 4,0 with doze of 6 U/g lignin peroxidase at 3% consistency and in the presence of 0,5 mM H2O2 and 4mM veratryl alcohol (Table 2). Table 1: Optimization parameters of XyzGeo71 treatment on kraft pulp. Table 2: Optimization parameters of LiPRHA1 treatment on kraft pulp. Enzyme treatment, as an environmentally-friendly bleaching technology, as a bleaching step positively affects the bleaching outcomes in subsequent stages (Bissoon et al. 2002). The possible biobleaching outcomes of enzyme treatment was observed at each stages of chemical bleaching of unbleached pine and eucalypts pulp. Enzyme dose and retention time are important parameters which enhance the discharge of chromophores. But longer periods of retention time or higher enzyme dose did not enhance the biobleaching efficacy considerably (Beg et al. 2001). The optimum enzyme dose is variable as units of enzyme per gram of dry pulp and the maximal useful activites are obtained after one or two hours of enzymatic treatment. For LiPRHA1 treatment, the performance of veratryl alcohol is so important because under surplus of H2O2 it equilibrates the enzyme and facilitates the transfer of electrons between substrate and enzyme as a mediator (Goodwin et al. 1995). Based on the experimental data, 4 mM veratryl alcohol was determined as optimum concentration. According to the literature, veratryl alcohol is used within the range of 2,5-4 mM (Arbeloa et al. 1992). After determination of the optimum conditions of the enzymes, they were used consecutively in an order for bleaching of the same pulp. Firstly, the pulps were treated with XyzGeo71 in optimized conditions. Subsequently, the pulps were treated with LiPRHA1 as a second step. When pulps were treated in the reverse order, i.e. first with LiPRHA1 and then, with XyzGeo71, any decrease in kappa number was not determined. As the first stage, XyzGeo71 treatment (X) reduced the Kappa number of pine and eucalypts kraft pulps by 4,81 and 5,54 points, respectively, indicating a 9,76% and 28,52% reduction in kappa number. On the other hand, LiPRHA1 treatment (X) reduced the Kappa number of pine and eucalypts kraft pulps by 3,52 and 4,06 points, respectively, indicating a 7,88% and 20,9% reduction in kappa number. The XyzGeo71-LiPRHA1 combination treatment (X), however, reduced the kappa number by 6,33 and 7,21 points for pine and eucalypts kraft pulps, respectively, indicating a 13,67% and 37,2% reduction in kappa number. The results indicated that the separate usage of XyzGeo71 or LiPRHA1 and the consecutive usage XyzGeo71and LiPRHA1 for the delignification of kraft pulp is more effective when compared to the literature (Comlekcioglu et al. 2014, Ahlawat et al. 2007). There are some examples reporting decreases in kappa number through enzymatic biobleaching. Pulpzyme HC, a commercial enzyme, displayed reduction in the kappa number of eucalypts kraft pulp by 10,4% (Roncero et al. 2003b). Zhao et al. (2006) reported the reduction in the kappa number of wheat straw pulp by 6,29%. Choudhury et al. (2006) observed 5,45% decrease in the kappa number of non-woody pulp using xylanase from Bacillus coagulans. Comlekcioglu et al. (2014) observed 9,03% and 13,78% decreases in the kappa number of pine and eucalypts kraft pulp using xylanase from Orpinomyces sp. Similarly, it was reported that combination of pectinase and xylanase produced from Bacillus subtilis and Bacillus pumilus was able to reduce the kappa number by 1,2 units, respectively (Ahlawat et al. 2007). There was not so much study about usage of lignin peroxidase for pulp bleaching. This is the first study for Rhodococcus jostii RHA1 for pulp belaching. The high level delignification of eucalypts and pine kraft pulps were identified through four stage XOQP treatment and the following chemical bleaching of eucalypts and pine kraft pulps. At the end of the TCF bleaching sequence, a remarkable reduction in kappa number of eucalypts and pine kraft pulps was obtained using XyzGeo71, LiPHA1, and consecutive XyzGeo71-LiPRHA1 treatment as 66,27% and 73,51%; 63,20% and 73,67%; 83,92% and 82,43%; respectively. The pine kraft pulp kappa number was reduced from 49,27 to 13,05 with XyzGeo71, from 44,67 to 11,76 with LiPRHA1, and from 46,28 to 8,13 with XyzGeo71- LiPRHA1. Similarly, the eucalypts kraft pulp kappa number was reduced from 19,42 to 6,55 via XyzGeo71, from 19,38 to 7,13 with LiPRHA1, and from 19,35 to 3,11 for consecutive XyzGeo71- LiPRHA1 treatment. 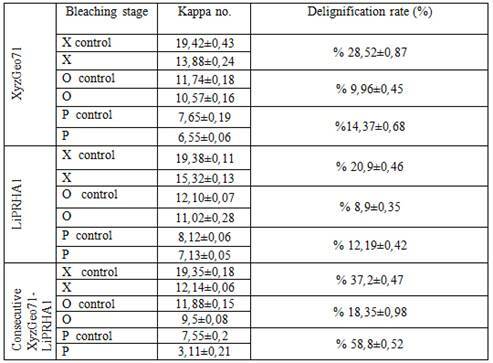 When the enzyme-pretreated pulp was bleached with XOQP sequence, after final bleaching stage, the process resulted in a remarkable decrease in kappa number and delignification rate as compared to control (Table 3 and Table 4). We have identified that the outcomes of consecutively pulp bleaching with the XyzGeo71 and LiPRHA1 were always better than the using only one of the enzymes. To find out whether the improved bleaching ability of XyzGeo71 and LiPRHA1 cocktail was due to their synergistic action or due to the independent action of each single enzyme, we studied sequential bleaching of pulps in detail with separate enzymes. Consecutive pulp bleaching with XyzGeo71 and LiPRHA1 results significantly higher pulp brightness and delignification rates than the usage of only XyzGeo71 or LiPRHA1. The delignification rate was almost doubled if consecutive pulping with XyzGeo71 and LiPRHA1 is performed as shown in Table 3 and 4. This indicates that XyzGeo71 and LiPRHA1 exhibit strong synergistic effect on pulp bleaching. The synergistic effect could be explained with the the better accssibility of LiPRHA1 to lignin that increased by the utilization of XyzGeo71 and enhanced enzymatic hydrolysis of lignin polymers. On the other hand, Nagar et al. 2013 reported that there might be two reasons of the increase in brightness after enzyme pretreatment. First, the xylanase could remove the xylan that precipitated on the lignin (Viikari et al. 1986). This xylan could be precipitated because of decreasing pH value at the end of cooking stage. Xylanase eliminates the xylan and thus the accessibility into pulp fiber increases for the second enzymes. The possible second reason is that lignin could be capable of forming complexes with polysaccharides such as xylan and some of the bonds of them could be alkali-resistant, therefore may not have been hydrolyzed during the kraft process (Buchert et al. 1992). Table 3: The effects of bleaching sequence on pine kraft pulp. Table 4: The effects of bleaching sequence on eucalypts kraft pulp. Bermek et al. (2000) reported that bleaching of hardwood kraft pulp with xylanase and MnP for 24 hours, supported with the continuous addition of a single alkaline/hydrogen peroxide, decreased the kappa number from 13,7 to 4,3 and increased pulp brightness from 35,3 to 78,1% (ISO). Based on the related data, the delignification rate was only 68,6% after 24 hours which is a lower value compared to our experimental findings. Sharma et al. (2014) also reported that the ClO2 savings were higher with consecutive treatment of xylanase followed by laccase (35%) when compared to the pulp singly pre-bleached with laccase (25%) or xylanase (15%). 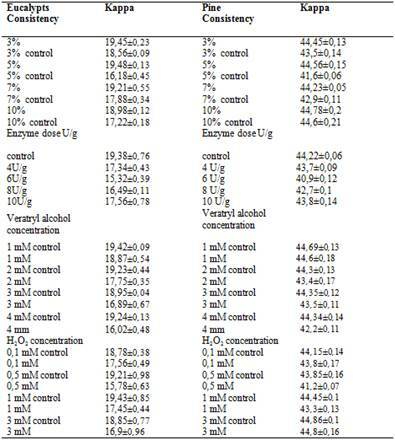 There are different enzyme combination studies in the literature except these studies. However, a xylanase lignin peroxidase combination study for pulp bleaching is not available. This study is the first report for the xylanase lignin peroxidase combination in pulp bleaching. 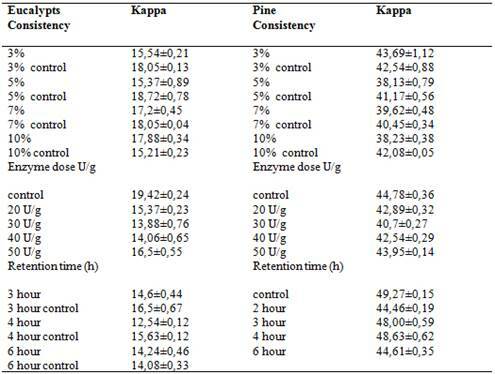 Alterations in the kappa number of enzyme-treated eucalypts and pine kraft pulps are given in Table 3 and Table 4. According to the results of first stage, the pine kraft pulp kappa number was reduced from 49,27 to 44,46 with XyzGeo71, 44,67 to 41,15 with LiPRHA1, and 46,28 to 39,95 with consecutive XyzGeo71 and LiPRHA1 treatment. The rate of delignification was determined as 9,76%; 7,88% and 13,67%, respectively. The eucalypts kraft pulp kappa number was reduced from 19,42 to 13,88 with XyzGeo71, 19,38 to 15,32 with LiPRHA1, and 19,35 to 12,14 with consecutive XyzGeo71 and LiPRHA1 treatment. On the other hand, the related delignification rate was identified as 28,52%; 20,9% and 37,2%, respectively. The results indicated that the best result is obtained from consecutive XyzGeo71 and LiPRHA1 usage for pulp bleaching. In this study, the conditions of oxygen delignification were applied as described previously in materials and methods section (chemical bleaching of kraft pulp). Following the oxygen delignification stage, the pine kraft pulp kappa number was reduced from 23,31 to 17,61 with XyzGeo71, 23,21 to 16,11 with LiPRHA1, and 23,28 to 12,10 with consecutive XyzGeo71 and LiPRHA1 treatment. The rate of delignification was determined as 24,45% 30,59% and 48,02% respectively. The eucalypts kraft pulp kappa number was reduced from 11,74 to 10,57 with XyzGeo71, 12,10 to 11,02 with LiPRHA1, and 11,88 to 9,5 with XyzGeo71-LiPRHA1. Futhermore, the rate of delignification was determined as 9,96%; 8,9% and 18,35; respectively. The chelating stage was applied to perform peroxide stage effectively as described previously in materials and methods section (chemical bleaching of kraft pulp). EDTA was used for the chelating which is highly crucial for the metal control in pulp. Through hydrogen peroxide bleaching, the pine kraft pulp kappa number was reduced from 16,25 to 13,05 using XyzGeo71, from 15,89 to 11,76 when LiPRHA1 used for biobleaching, and from 16,11 to 8,13 with the consecutive use of XyzGeo71- LiPRHA1 as shown in Table 3. The delignification rate was determined as 19,69% 25,99% and 49,5% respectively. 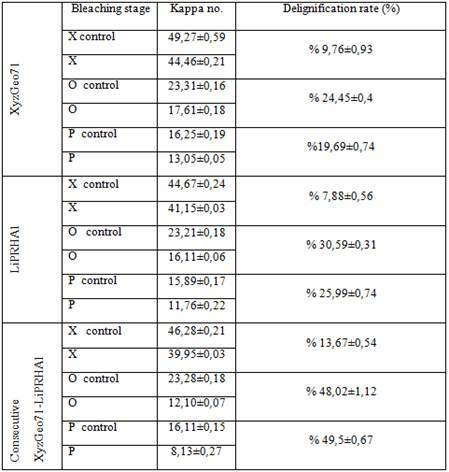 The eucalypts kraft pulp kappa number was reduced from 7,65 to 6,55 with XyzGeo71, 8,12 to 7,13 with LiPRHA1 and 7,55 to 3,11 with consecutive XyzGeo71 and LiPRHA1 treatment, the results are also given in Table 4. In addition, the rate of delignification was determined as 14,37%; 12,19% and 58,8 %, respectively. As it is understood from the results, consecutive XyzGeo71 and LiPRHA1 treatment is more effective than the single usage of enzymes. Paper samples were obtained from pulp with the Rapid-Köthen method and treated for 24 h in an air-conditioned room based on ISO 287. Standard optical and physical properties of each paper were then determined according to TAPPI standards. The pine and eucalypts kraft pulps were bleached using a totally chlorine-free (TCF) method. The pulps subjected to XOQP bleaching sequence showed relatively similar physical properties with control sample. According to results, breaking length, burst index, tear index, and tensile index of kraft pulp handsheets decreased partly after pulp biobleaching. In another words, no significant alterations were identified in the physical properties of enzyme-treated samples (Table 5). Following the bleaching stage, the changes in pulp properties were examined and compared with those of control samples treated identically except enzyme addition. The final gain in the brightness of enzyme-treated pine kraft pulp (54,89% ISO) was 2,57 points (52,32% ISO) for XyzGeo71, (61,72% ISO) 9,51 points (52,21% ISO) for LiPRHA1 and (63,12% ISO) 12,01 points (52,11% ISO) for consecutive XyzGeo71 and LiPRHA1 treatment and eucalypts kraft pulp (64,24% ISO) was 2,11 points (62,13% ISO) for XyzGeo71, (75,52% ISO) 1,76 points (77,28% ISO) for LiPRHA1 and (72,91% ISO) 6,17 points (66,74% ISO) for consecutive XyzGeo71 and LiPRHA1 treatment as shown in Table 5. As a result of this study; XyzGeo71, LiPRHA1, consecutive XyzGeo71 and LiPRHA1 treatment revealed 4,68%; 15,04%; 15,85% and 3,28%; 2,27%; 8,46% increase in brigthness on pine and eucalypts kraft pulp, respectively. Table 5: The physical properties of eucalypts and pine kraft pulp. Our results further indicated that following the enzyme-based bleaching, paper brightness was also improved significantly, although any improvement in paper properties was not identified (Table 5). The decrease of paper properties in burst index, breaking length, tensile index and tear index were reported from several xylanase treatments (Saleem et al. 2009, Bissoon et al. 2002, Comlekcioglu et al. 2014). There are also some other xylanases reported from different bacterial cultures that utilized to increase the brightness of paper. For instance, the birchwood kraft pulps brigthness was reduced by 6,9% when treated with Streptomyces thermoviolaceus xylanase (Garg et al. 1998). Bacillus sp. NCIM 59 xylanase provided 2,5% increase in the brightness of bagasse pulp (Kulkarni and Rao 1996), while xylanase from Bacillus pumilus triggered 6,5% increase in the brightness (Bim and Franco 2000) when applied to eucalypts pulp. Sharma et al. (2014) reported that sequential enzyme treatment (xylanase-laccase) resulted in improved pulp properties (15,71% increased tear index). Bermek et al. (2000) reported that bleaching together with xylanse and MnP for 24 hours that continues with a single alkaline/hydrogen peroxide treatment significantly increased pulp brightness from 35,3 to 78,1% (ISO). SEM studies clearly displayed morphological changes in the pulp fibers after treatment with enzyme (Nagar et al. 2013). Some morphological changes such as cracks, flakes, holes, filaments, and peeling are caused by enzyme treatment. These cracks and holes permit the diffusion of larger lignin macromolecules, as reported by some authors. Roncero et al. (2003a) reported that the fibres of initial pulp are smooth and clean, and the sample shows no fibrillation and it does show fibres of different thickness. Enzyme treatment of kraft pulps is responsible for opening pores in the cell walls of fibers and improves the accessibility of bleaching chemicals to the pulps by increasing the diffusion movement of degraded lignin fragments to outward. The effect of enzymatic treatment on fibre surfaces was more obvious after the X stage on pine and eucalypts kraft pulps. The SEM results clearly demonstrated that the control pine and eucalypts kraft pulp fibres were smooth and showed a uniform surface devoid of prominent fiber formation, whereas enzyme-treated pine and eucalypts kraft pulp became irregular and heterogeneous with the occurrence of cracked and peeled fibres on the surface (Figure 1). The fiber properties are important on paper quality but long fiber lengths are preferable for manufacture of paper (Kiaei et al. 2014). These changes in pulp fibres only the accessibility of chemicals used in subsequent bleaching stages so it does not effect the paper quality. The current data obtained from the enzyme-treated pulps (% brightness value) comfirmed that both XyzGeo71 and LiPRHA1 enzymes are potentially promising candidates for industrial applications. The findings from the consecutive use of both enzymes further highlight that the bleaching cocktails generated from enzymes have better catalytic activities. Appropriate addition of these enzymes to bleaching sequences will be promote more cost-effective and environmentally-friendly applications of pulp biobleaching. A consecutive bleaching treatment of pulps with xylanase and lignin peroxidase was found to be superior than the single enzyme treatments in terms of delignification rate and was eventually be able to reduce the kappa numbers in the final bleach effluents. Our results indicate that usage of the xylanase and lignin peroxidase produced from domestic source can reduce external-source dependency, release of harmful chemicals into the environment, processing cost, and improve the biobleaching-based paper quality produced. All authors would like to acknowledge Karadeniz Technical University Research Foundation (Grant no. 347 FBA-2014-134) and TUBITAK (The Scientific and Technological Research Council of Turkey, Project No: 113Z741) for their support. Authors are thankful to Lindsay D. Eltis (University of British Columbia, Canada) for providing Rhodococcus jostii RHA1 and S. L. Wong (University of Calgary, Canada) for providing Bacillus WB800 cell lines and Dr. Yu Xia (Jiangnan University, China) for providing pMA0911 plasmid. Authors are also thankful to Asst. Prof. Dr. Ugur UZUNER (Karadeniz Technical University) for editing the manuscript.